Israel will return to Egypt two wooden artifacts that had been plucked out two ancient caskets dating to the Modern Kingdom, Cairo said Wednesday. Inspectors of the Unit for Prevention of Antiquities Robbery found parts of two stolen Egyptian sarcophagus covers in April while checking shops in a marketplace in the Old City of Jerusalem. The two plaster-covered wooden lids had been sawed in two, causing irreparable damage. The covers were adorned with decorations and ancient Egyptian hieroglyphics. The Israel Antiquities Authority said one dates between the 16th and 14th centuries BC and the other to between the 10th and 8th centuries BC. Egyptian Antiquities Minister Mohamed Ibrahim told Al-Masry Al-Youm that a task force formed by his ministry and the Foreign Ministry negotiated with the Israeli side through the Egyptian embassy in Tel Aviv for over a year. He said the process asserted Egypt’s right to the items which, he said, had been illegally smuggled out of the country. Ibrahim said he had brief the embassy in Tel Aviv regarding Israel's willingness to return the artifacts to Cairo. Osama al-Nahas, general director for the retrieved antiquities department, said both pieces were discovered during a routine inspection by Israeli authorities. He said inspectors noticed that both artifacts were cut with a chainsaw. Nahas explained that the bazaar owner told inspectors that he had bought the items from a merchant in Dubai before he legally transferred them to Israel via London. The Israel Antiquities Authority said it "acknowledges the fact that the artifacts belong to the Egyptian people and culture and is interested in finding a legal way to return them to Egypt." 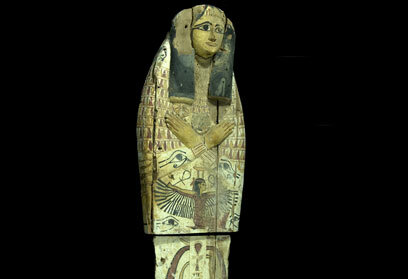 See all talkbacks "Egypt: Israel to return stolen sarcophagus lids "